Congratulations to the Snow Canyon Little League Junior Girls Softball All Star Team who won the State Championship Tournament held in Cedar City and at press time are 2-0 in Tucson, Arizona at the Western Regional Tournament. Our local Little League Baseball and Softball programs have a long and very successful history of providing competitive sports and leadership opportunities for Santa Clara youth. These teams and coaches represent our community well and I wish them good luck going forward. Thanks to their parents, coaches, fans and financial supporters as well. Make us proud ladies! In case you were curious, the City issued 147 new home building permits from July 1, 2017 to June 30, 2018 primarily in the area north of Harmon’s. This number is down slightly from the 168 permits issued last year, but the City is still growing at a very rapid pace. In addition, several new development proposals have started the project review and discussion process with the City Staff and Planning Commission, and the debate regarding the desire to build more short-term vacation rentals and large single-family estate lots versus the need for more affordable family housing is raging again. Balancing private property rights and market demands with neighborhood concerns and community needs is never easy and the subject will continue to be debated in our commission and council meetings for as long as Santa Clara is a desirous place to live. A heartfelt thanks to the volunteers on the Planning Commission and other local community boards and committees for your important service to the residents and businesses of Santa Clara. Thanks also to the City Council for your leadership and the numerous hours you spend listening to residents, researching project requests, meeting with staff and legal counsel to understand projects, local ordinances and state law, and most importantly, your willingness to make hard decisions. July brought desperately needed rains and moisture to the area, but unfortunately it came too much too fast in some areas. Recent improvements to the city drainage system and funded by residents and new development helped Santa Clara manage to avoid the mud and flood dam-age experienced by our neighbors in Dammeron Valley and Washington City this year (knock on wood). Our hearts go out to those whose homes and property were damaged, we’ve been there. City public works crews were dispatched to help our neighboring communities deal with the flood cleanup. City wildland fire crews have been very busy this summer throughout the state assisting with wildfire suppression efforts. We are lucky to have the special and unique skills these City crews have. These men and women do a great job with limited resources and I really appreciate their efforts to protect my home, family and the community. Have a great August and stay safe Santa Clara. SWISS DAYS WILL BE HERE BEFORE YOU KNOW IT! The weekend of September 20-22nd will be full of great fun, fabulous entertainment, good food, rich history, and of course reconnecting with friends and family! The theme for Swiss Days 2018 is “CELEBRATING TRADI-TIONS.” The event will kick off Thursday night with a Community Dinner (lots of great food at only $6.00 a plate!) and Opening Ceremonies where we will be braid-ing the Maypole to highlight a classic Santa Clara tradi-tion. We are excited this year to have CHARLEY JEN-KINS as our free Friday night concert! You won’t want to miss this one! Check out his bio at charleyjenkins.com. Take a look at our schedule of events in this newsletter and on the City website at sccity.org/swiss-days. This is a great weekend for family reunions and get togethers as Swiss Days will provide all the entertainment for both young and old! If you have attended Swiss Days before than you already know what a great time it is, and if you haven’t attended yet.. you need to come see what you’ve been missing! Mark you calendars! The Swiss Days Community Dinner will be held Thursday September 20, 2018 from 5—7 p.m. on the East lawn at Town Hall. Dinner will include grilled hamburgers and hot dogs with sides including baked beans, salad, chips and dessert. Dinner tickets are $6 and available at the City Office in advance or can be purchased at the dinner. Musical entertainment will be provided by Casey Lofthouse so be sure to come enjoy a fun evening with family, friends, yummy food and great entertainment! Other Thursday evening events include Displays and the Historical Society Silent Auction in the Banquet Room. The Opening Ceremony under the big tent will include a Flag Ceremony, Braiding of the Maypole and introductions of the Grand Marshal , Volunteer of the Year, and our Santa Clara Royalty. These events are the kick off to a great Swiss Days weekend and we hope to see you there! Look for the full schedule of events enclosed. Event forms, applications and sponsorship information can also be found on our website at www.sccity.org. or pick up apps at the city office. 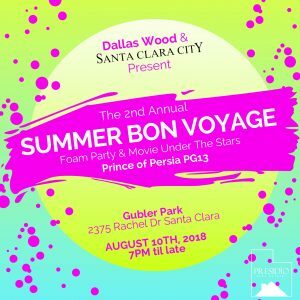 We are inviting all Santa Clara City friends and neighbors to join your Parks Department and Dallis Wood of Presidio Real Estate for a fun filled evening at our Second Annual Summer Bon Voyage movie at Gubler Park, 2375 Rachel Drive. There will be a foam party starting at 7 pm and the movie “Prince of Persia (PG 13)” will start at Dusk. Hope to see you there! SEPTEMBER CLEAN UP DUMPSTERS will be avail-able September 7th & 8th. As usual there will be 3 dumpsters at the Little League Parking Lot and 1 at the Town Hall Parking Lot. Please do not leave trash on the ground before dumpsters arrive or after they are removed. If you have large items such as furniture or appliances that need disposed of please call Republic Services at 628-2821 to schedule special pick up. Also dumpsters are not for disposal of tires, paint, batteries, any hazardous chemical waste, or construction site waste—construction sites should have their own dumpsters . Please see September newsletter for reminder and more information. Sources of pollution to our storm water System include leaves, grass clippings, organic material, dirt and debris. Residents need to be aware that it is against the City Storm Water Ordinance [Chapter 13:24] to sweep or blow leaves and grass clippings into the street, curb and gutter or sidewalk. Residents are also responsible to retain any dirt, top soil or rock etc. onto their property. The City is committed to protect our water quality. Your help is needed to help protect this valuable resource. Together we do make a difference. Please report violations to the DCSWC (Dixie Clean Storm Water Coalition Hot line at (435)634-5730 or the main City office at (435)656-4690 X 222.